The Best Kept Secret That Everyone Will Want To Know About Once They Receive A Card! 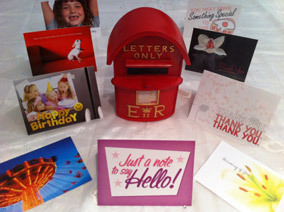 Sending a REAL personalised greeting card straight from your computer couldn’t be easier! YOU can choose from over 15,000 of our stock cards, write your own personalised message (even with your own handwriting and signature) and click to send. We then do the rest: print, stuff and mail it without you leaving the comfort of your sofa or office. If you’d like to use your own images or logs then why not design your own custom card at very little extra cost. The process is as simple as sending an e-card but a real physical card is sent instead. Why You Should Send Cards? Everyone would like to keep in better contact with those closest to them, but sometimes leading such busy lives gets in the way. This is how I first became involved with our company as I was frustrated at often remembering on the day of someone’s birthday (resulting in a belated card) or never being able to find the appropriate card for that special person. The FREE reminder system really appealed to me as I could see by using this feature there was no real reason for me to be late in sending a card again. Imagine the impact on the people in your life when they receive an unexpected or customised card from you. How do you think that would make them feel? Business contacts and friends will be surprised and appreciated as people rarely take the time to send a card with that personal touch. For businesses there is no better way to show appreciation than using our unique and seamless system. It will have a huge impact on your business through increased customer satisfaction and encourage receipt of referrals, if used in a consistent fashion. With our free contact manager and reminder system you can efficiently create formal or quirky campaigns and use them over and over again to convey your message, saving time and effort whilst being economical. This is a fantastic way to show people how much you care about them, that you are thinking of them and if using for business also acts as a reminder of the services you offer. To send a FREE card, without obligation, please provide your name and e-mail address and I will arrange for you to test-drive our system. Please note that if you are outside the United States payment is made in US$ and your cards will arrive with a US stamp on the envelope. Don’t see this as a disadvantage though, often an even bigger impact is made with the US stamp as recipients are always eager to find out who has sent them a card from abroad! Bring cheer throughout the year and save on what you spend with our click and send system.